To properly appreciate the taste of a beer, it needs to be served at the right temperature and this varies between different beer styles. Serving the beer at the correct temperature allows you to fully taste its flavours. The colder a beer is the less carbonation that is released, which in turn releases fewer aromas. In addition, when the beer is too cold it numbs your palate so that you cant pick up the beers nuanced flavours. Lighter lagers like a Hahn Super Dry are best served between 2-4C with fuller bodied European styled lagers like a James Boags Draught are best enjoyed at a slightly higher temperature around 4-7C. Fuller styles of beer like the IPAs, Porters and Stouts are best enjoyed around 7-10C, which helps bring out the complex flavours of these beers, and if you are going for a Belgian, Scottish or British Ale then you are best to have it served at around 10-13C. Hold the beer up to a light and observe the hue. The colour of a beer can range from straw coloured to black. Red hues, for example, often indicates rich caramel flavour, whereas black usually means coffee or chocolate notes. Dont be concerned about the clarity of the beer. Beer can be either clear or cloudy, depending on the filtration method and isnt an indication of its quality. Aroma makes up 80% of flavour, so its incredibly important to take the time to appreciate and evaluate it. Our sense of smell is a thousand times sharper than our sense of taste, so theres a lot we can learn about a beer before we even taste it. Gently swirl the glass, which helps oxygen mix with the beer, releasing a more pronounced aroma. Now take a series of short and long sniffs. Different people will be able to smell different things in a beer so if you smell something different to someone else, thats fine. It is easier to start with your general impressions  is the aroma strong? Is it sharp, which would be the hop aroma, or sweet, which is the malt aroma? Or perhaps its a balance of different aromas? You can then delve deeper into identifying specific aromas like toast, nut, caramel, floral, herbal, spice, citrus and fruit. Taste will naturally follow on from aroma, and the three common tastes we refer to with beer are sweetness from the flavour in the malts, bitter from the hops, and acidity from the brewing process or added fruits. 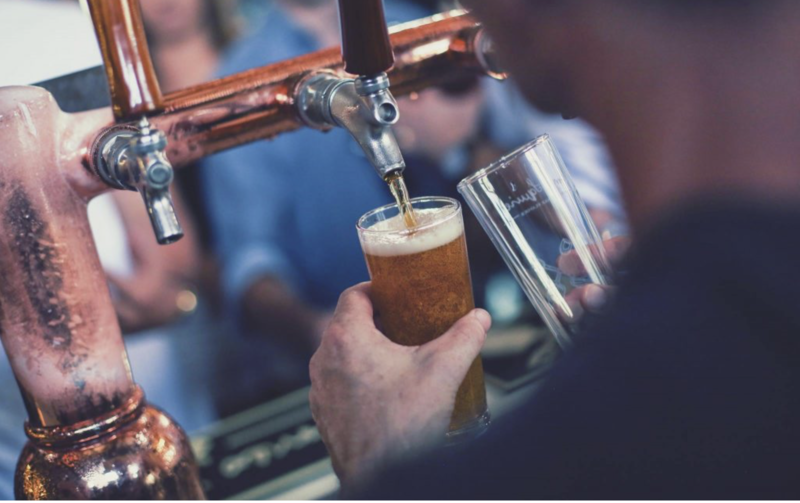 Beers actually have a whole range of tastes depending on the ingredients, brewing process, yeast and other elements and some will be easier for us to taste than others. The kinds of flavours found in beer include the same aromas mentioned above, with smell and taste so intrinsically linked. When you take a sip, swirl the beer around in your mouth first before swallowing it. As with aroma, start with your general impressions of the taste, from the intensity of the flavour to the balance of sweetness and bitterness. The aftertaste of beers is also important, so keep this in mind when tasting your next beer. We feel the texture of beer on our tongue, in our cheeks, and along the roof of our mouth. Each area reveals a different layer of the beer. As an example, real ales are relatively flat, full and warm. This is by design and not because the beer is old or off. The texture of a beer changes the way you drink it, and influences the how, when, and where of its drinking. Body – Is it thin and refreshing, like water, or is it full and silky like a glass of milk? Astringency – Does it dry out your mouth leaving you wanting another sip or does it leave your mouth feeling full and satisfied? Carbonation – Does it jump around in your mouth feeling fizzy and lively, or is it flatter with a less noticeable fizz? The more time you spend familiarising yourself with each element of beer, the more your palate and knowledge will continue to evolve and grow. Theres such diversity in the world of beer, with an incredible range of styles and flavours to try, so dive in and enjoy the journey!